An updated CX5 Material List has been released. the aft fuselage drawing (sheet 4) will require changes. Dave recommends not making the CX5 bulkheads until he can get the changes made and distributed to everyone. 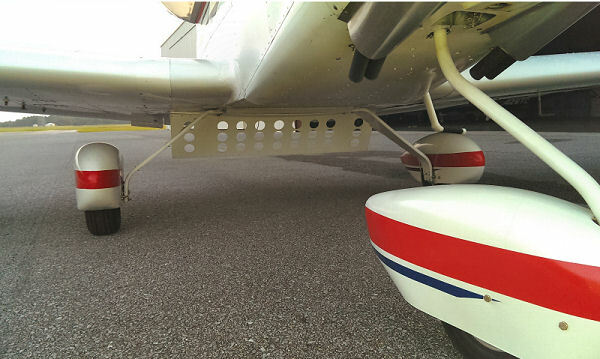 Thatcher Aircraft, Inc. has just released a Recommended Modification for the CX4 & CX5 Tail Wheel Spring Mount. It was reported on February 26, 2015 that during a routine condition inspection of a CX4 with 485 hours of rough sod field operation, cracks were found on the F12 bulkhead where the tail wheel bracket attaches. After investigation, cracks were found on the F12 bulkhead and lower skin due to a rocking action of the 3/16” x 1-1/2” mount angle for the tail wheel spring. It is recommended to remove the angle and replace with the bracket shown in the advisory. Details of the modification can be found on the Thatcher CX4 & CX5 website. 2015/3/16 An updated CX5 Material List has been released. 2015/3/3 With Dave's recent release of major updates to the CX5 Plans & Builders Manual, we thought it would be good if a summary sheet of all current dates in the set would be available. We reviewed all the updates since the CX5 plans were originally released, and compiled a complete list of the individual plan sheets most current dates as of today. 2015/3/2 A new CX5 Material List has been released. 4) Qty Chg: 2 to 6 of NF46-3 bearings. 2015/3/1 Aircraft Spruce has added the CX5 to its on-line Kits/Plans webpage! What does this mean? It greatly simplifies the process for builders when ordering parts from them. Simply go to the Kit/Plans page on their website (Aircraft Spruce Kits/Plans). Click on "Thatcher" in the list on the left, then click on "Thatcher CX5" to go to the page with the Thatcher CX5 information & parts available under AS kit part number 01-01439. The most important feature of this new webpage is the ability to see a complete listing of the individual parts, and edit the quantity desired (0, 1, 2, 3, etc) of any or all items on the list before placing your order. Their on-line list will always reflect the current pricing for each item. To see the expanded list, click on the "Click here for Expanded Kit Components" on their webpage. The Aircraft Spruce expanded list reflects the parts they have available as shown on the CX5 Material List dated February 8, 2015. It will be necessary to edit your order for any changes released after this date (See "CX5 Material List" change notices on the "Prototype Update" page. Editor Note: On behalf of all the current and future CX5 builders around the world, we'd really like to thank both Josh Solis and Michael Vega at Aircraft Spruce for their time and effort in making this new webpage available! 2015/2/8 A new CX5 Material List has been released. 1) Qty Chg: 2 to 4 of 1-1/2 X 1-1/2 x 3/16” 6061T6 8 foot angle. 2015/2/4 A new CX5 Material List has been released. 1) Qty of FMN-10 bearings has increased from 8 to 12. 2) One foot of 1/4 x 0.194 4130 Steel tube has been added for the H4 aileron bellcranks. 2015/1/28 The CX5 Material List has been updated. Dave Thatcher is building another CX5. One of the reasons he has mentioned is his desire to fine-tune the plans, builders manual and material list he created while building Glen Bradley's CX5 S/N 001. We can expect occasional changes to the material list as he works his way through the build, and this update can be considered the first one he is releasing. 1) The brand and part number of the main gear tires has been clarified. 2) Aluminum Cherry rivets are replacing the Stainless Steel Cherry rivets previously listed. 3) 4130 bar stock width (from Wicks) has been increased in width from 1" to 1-1/2". Editor Note: We also have a folder in the files section of the Yahoo group site where this updated CX5 Material list will be posted. CX4 & CX5 Tri-gear front strut and wheel fork. A recent event with the nose gear on CX5 001 prompted this modification that Dave Thatcher recommends be done on all CX4 & CX5 Tri-gear front forks. A minor engine oil leak was discovered, with oil traveling down the front strut that ultimately impregnated the Belleville washer stack. This oil relieved the preload on the washer stack, and allowed a severe shimmy to occur on the front wheel assembly during taxi. The front wheel assembly rotated 360° during the shimmy, and entered the prop arc. 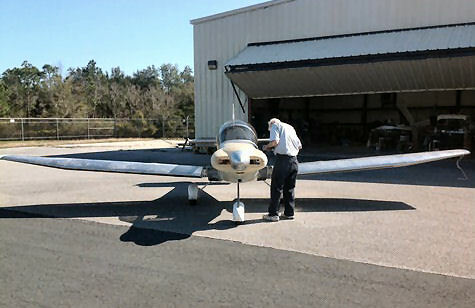 The prop and wheel pant were damaged. To prevent this extreme rotation in the future, a wheel stop was designed to limit the front wheel rotation to 45° left and 45° right of center. Details of this modification has been added to the "Advisories" page of www.thatchercx4.com. Note: The complete Advisory is in a PDF format that can easily be printed and saved. Teleflex rudder cables used in all CX4's in back in March of 2013. Dave had requested that this modification be immediately posted on the CX4 & CX5 Community website. An oversight was made when this important modification was not added to the Thatchercx4.com "Advisory" webpage. This has been corrected. 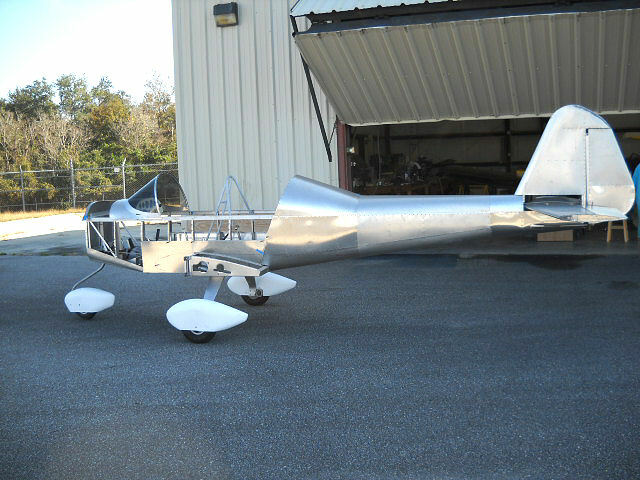 Details of this modification have been added to the "Advisories" page of www.thatchercx4.com. 2014/10/15 An updated CX5 Material List is now available. Great Plains Aircraft Supply has reported an increase in the price of the CX5 Gear from 500.00 to 690.00 USD. Editor Note: We also have a folder in the files section of the Yahoo group site where this updated CX5 Material list is also available. 2014/10/2 An updated CX5 Material List is now available. Dave has changed MS24694-S56 shown on page 1 to MS24694-S53, and increased the QTY from 10 to 28. 2014/7/26 Dave has released an updated CX5 Material List. Glen's PIREP below gives us some initial detail on the operation and performance enhancements made possible with the revised speed brake on the CX5. Dave has updated the Material List to reflect the changes. 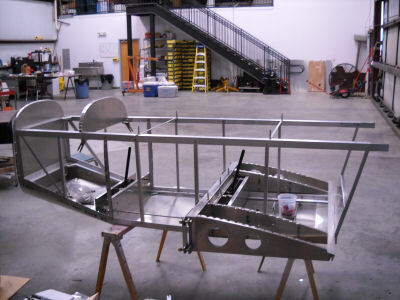 Greg Westberry (Westberry Manufacturing, LLC), with Dave's involvement, has completed testing of a CX5 wing. The wing was mounted on a test stand and loaded to both 3.8 G and 5.7 G levels. The wing passed both tests. Photo's of the testing can be seen on Dave's website (http://www.thatchercx4.com/load_test.htm). (Scroll down to the bottom of the page). 2014/6/20 Dave has released an updated CX5 Material List. The line item containing 10 ft of 1/2" x .058 4130 tubing has been removed. Dave reports that it was used in the engine mount, but he has gone to a bigger tube for the mount. Editor Note: We also have a folder in the files section of the Yahoo group site where the most recently updated CX5 Material list is available. A load test of the wing has been in mind from the start. I can not do it. Mr. Greg Westberry, who makes the kits for the CX4, and will be making the kit for the CX5, and is going to do the test. He will prove out his wing kit as well. This means making a wing and center section, taking it to 3.8 g's, then on to 6 g's. I have sent him the funds to do this. Now give him a chance. He is a very busy man. The CX4 is still a very popular airplane. Is every one straight on the wing bolt question now? I used 6 as my design figure because the sand bags come in 50 lb bags. This makes the math easy and includes in the safety factor, plus some. Mr. Anderson thought I was using 6 g's as the limit load factor and needed to add 1.5 g's more for safety. The bolts would not hold 7.5 g's. I apologize to him for this miss understanding and appreciate his contribution to the Yahoo Group." Dave has gotten involved, and asked that anyone having difficulty with getting the desired travels contact him directly via email. Expecting the same topic to be raised with the CX5, Glen recorded a brief video showing the control surface travel he has in the CX5. 2014/3/18 The day people around the world have been waiting for has arrived! Dave Thatcher has released the plans for the CX5! The plans and manual to the CX5 are ready. The price is $475.00 and I pay for the shipping. Contact Dave via email at ThatcherCX4@cox.net or give him a call at (850) 712-4539 if you're interested in purchasing a set! Glen managed a short CX5 flight today, just before sunset. His PIREP follows the video. "I had to drive the carpool today so I was 15 min away from the airport in AL with only one hour to get there, get the plane out, and fly before official sunset. I made it! I flew a short flight to check out our latest cowl changes, which are almost like what we had weeks ago. It went well. Temps were very good. I landed and had the plane in the hangar with a few minutes to spare. This is the first video that I've done with the front off the camera to allow better sound. I think it worked well. I took off and climbed at full power to about 1000 feet --during this climb I had a climb rate of 800 fpm at 80 and 1000 at 75 mph....and then cut back to 25 inches and cruise climbed at 90 or better to 2000 ft. Then I cut back to 22 in and had 3100 rpm (and 110 mph). That is what my hand signals mean. I did some mild wing over type maneuvers and then a 360 degree steep turn... when I hit my own wake I knew I was finished with the turn. (You can see a mild bump in the video just before I stop the turn.) I eventually descended at 20 inches at about 300 fpm and an airspeed of 130-135 mph to enter the pattern at about 1000feet. I am still not used to how well the CX5 glides so I ended up a little high and slipped it all the way down final. This runway has a 500 foot displaced threshold. Notice the very flat approach path on final - power was at idle since base turn began ( I DID clear the throttle on mid-base). I landed and used no brakes until just before turnoff and taxied in at 35-40 for a while to show the ease of control during taxi. It was a nice flight on a beautiful day. The day looks even better on the Sony Cam than it did in person. I hope you enjoy the video. I really like being able to talk and have it heard on the video. Tomorrow is a full day of flying so I should get most of the remaining 5 hours or so done and be ready for Sunday's air-to-air video and photo shoot. The photo plane will be a Legend Cub and I hope to have some video from my Sony Cam to post Sunday night. The photos are to be used on magazine covers and promotional items. Let me know if you like this video... When I made it I was guessing if I could be heard and trying to think of things you guys would like to see." Glen Bradley released a short video of todays CX5 flight. with Glens response follow the video. This 11 min video is unremarkable but since I haven't sent one in a while I thought I would. I filmed for 45 min straight but for some reason the camera broke it up into 34 min and 11 min. I don't know why or how but here is the 11 min video. It shows me at 3000 feet and then descending to land. I am working my way down to pattern altitude while setting myself up with good spacing for the several students flying the pattern. They are probably not visible in the video but that is why I am making all the turns while descending and talking on the radio a lot. Note the flat glide angle on approach during base and final- and that is with idle power. I do clear the carb once with a short burst of power. Also, it was a gusty day with a crosswind that was switching direction but was mostly from my right so lots of corrections on final. Then, immediately before I touched down I got a pretty big gust from the right....that is why I used full right aileron on landing. It was a full stall landing so the stick was full back and full right on touchdown. The bumping motion is from the camera vibrating on the canopy mount , not from the runway. The runway is actually very smooth. Same thing on startup...the engine is really quite smooth but the canopy mount vibrates at idle. When I pick up the RPM a bit it smoothes out. Again...not really much to see but thought some of you might want to see some kind of video. Hobbs 34.5 as I recall. Not long now.....smiling. After Glen released the video, a comment was made and a question was asked. 1) On Sun, Feb 2, 2014 at 8:42 PM, Herb wrote: You look mighty relaxed! A) When I fly I am not exactly on edge but am VERY alert. I am focused and that leaves little room for anxiety. I was a little on edge before the first flight but when I taxied out it pretty much went away.....time to focus. IF I have any anxiety at all- usually very little- it is while preparing to fly, driving to the airport etc. I find that a ROUTINE is very comforting too....and safer. I will admit that flying a new design is not like anything else I have done because of the unknowns involved. That first flight of just a few minutes, though, really relaxed me quite a bit because the 5 flew so much like the 4. It has been interesting to say the least. If I had not had immense trust in Dave and had not been so involved in the build it would have been different too. B) The 5 is not a demanding airplane to fly at all. It simply does what you tell it to...no more, no less. As you can see it is very easy to keep straight on takeoff and landing as well as taxi. And the visibility from the cockpit is just stunning. 2) On Sun, Feb 2, 2014 at 9:17 PM, Patrick Panzera wrote: Wow! What a beautiful flight and a beautiful day. What's the cause of the engine sound changing dramatically at 2:09? I don't know...the engine didn't actually change at all. Must be something to do with the mike setup on the camera. It is in an airtight case and little sound gets in so maybe it leaked or whatever. Altitude / pressure change in the camera housing maybe????? It was a nice day. I've missed several nice days like that for various reasons . For many of the days I was right under an overcast layer at 2k or less. I plan on some videos showing more maneuvering etc. "I have only about 5 hours to go and the CX5 will be FREE!!! The bad news is that rain is predicted for the next 6 days here. I will keep the list posted. I had an air to air photo session scheduled for last Fri but the photographer had to go out of town so we rescheduled for this Th or Fri if the weather permits. We need only a couple of hours to get both planes down to Alabama and complete the mission. Should be easy since the airport is only 5 miles from the beach and we want to use the beach as a background. Several of you commented about the changing sound in the 11 min video. I don't know why the sound changes like that. It certainly isn't the engine or anything else because I don't hear any changes while flying. The camera is housed in a waterproof box and maybe the air pressure changing at altitude eventually results in some kind of pressure change inside the camera housing....kinda like our ears popping.....just a guess. I am pretty sure we have the engine temps where we want them to be. I will know the very next flight. They were OK but I wanted them a little cooler. The brakes are wonderful and there simply are NO issues with the plane. Everything has functioned flawlessly and all we have done is optimize things that were not as nice as we wanted (brakes, engine cooling, carb heat). The engine has been superb. I love the acceleration, how it goes uphill, and the visibility is truly awesome. I will keep the list posted. Looks like this week is going to be mostly EXERCISE week instead of flying but if I get a smidgen of a chance I'll be up there looking down and sending the list posts. 2014/2/1 Glen continues to build time on the CX5 - The Hobbs is now at 32 hours! "I got to the hangar in AL early yesterday and found a sheet of thick ice 15 feet wide in front of the hangar door. My car and the airplane tug would not break it so I had to wait a couple of hours until it melted some. Finally chipped a 3 foot wide path in front of the plane so I could pull it out. It was 51 degrees by then so it melted a lot while I was flying. Oil temp was a little higher than we want but we know how to fix it....will do that next week. Had to fly around a buzzard on take off at 200 feet. He didn't budge. If I send the video out you can see him on it just after lift off. No significant issues to report....just flying the hours off. Pat Panzera was nice enough to also send me an ASI that is much more readable at lower airspeeds. I plan on using it for the rest of the testing to get accurate stall numbers, approach numbers etc. It goes only to 120 mph so I am wondering it it will be damaged when I fly faster than 120 which I do regularly. Anybody know the answer to that question?" "I got to the airport in Alabama just as the sun was coming up ready to fly. I was in the air within 30 minutes. Our new cowl changes did not provide the extra cooling we were after. In fact, the cooling was not as good as it had been before the last set of changes. Actually, it was not too bad at cruise but still way hotter than I prefer and in climb it had been hotter than it had ever been - CHT about 50 degrees hotter. So I did some longitudinal stability tests, and gathered data that we needed to choose a new prop while waiting to see how far the temps would come down at cruise. They did drop quite a bit and then stabilized >>> but they were still too hot for my liking. The outside air temp was rapidly climbing and the temps were still making me nervous so I landed and pulled the cowl off AGAIN. Dave and I can make the next set of changes tomorrow and I will reinstall it tomorrow night. By chance tomorrow I have to drive a swim carpool to a city ten miles from the airport, Orange Beach, so I will have over 2 hours with nothing much to do while the kids swim. I usually drive Tu and hang out at the airport anyway...even though it is dark and I can't fly. I was hoping to fly Tuesday and Wednesday of this week but high winds are forecast, and believe it or not SNOW is forecast for Wed. What a hoot!!!! So I may not get to fly much of this week until the end of the week. I also have to work in some annual medical tests. The new brake set up worked very well, as did the Manifold Pressure gauge that Pat gave me. Remember that there is often some gauge error. I did not do any WOT testing due to the high CHT issue. The longitudinal stability tests turned out really well. The CX5 is VERY longitudinally stable. I will have all the specific data in the little POH I write up at the end of the 40 hours. It was a good day to fly and 3 students soloed while I took the cowl off and buttoned up the plane. To risk being redundant....if one thinks about all the changes Dave and I are working through (brakes, cowl. etc. ), I would strongly recommend that one thing twice before building the airplane with changes from the plans because many of the "simple' things were time consuming to get just right. I wish all you builders the best in your projects and remember - I smile a lot while flying the 5 - you just can't see my face (that's a good thing). haha"
"I imagine some of you are wondering why no recent update on the 5, right? Well, it's because there really isn't any update to speak of....not a flying update anyway. Flying is the easy part....we've been doing the hard part. Dave and I have spent the last couple of weeks waiting out bad weather or waiting on parts ( 5 gorgeous days and 3 very good days were lost). Dave is redoing the Master cylinder setup to get the best possible taxi control. It was OK - but OK is not the way we want a Thatcher Airplane to be. We want it to be AWESOME. After about 5 different setups including different size master cylinders and different linkages etc. we finally have it just like we want it. It was a very tedious and time consuming process. Thank God Dave is so darn talented.....and patient! Dave and I drove to the airport in Alabama today through sleet and snow.....no kidding. Sleet and snow. To be fair- it was very LITTLE sleet and snow but it WAS real. We installed the system Dave just remade (again) and I taxied the 5 around. AWESOME. It is a superb system now... not just a good one. We also made new exhaust exit covers for more cooling. These look just like the ones shown n the photos on the site (see photo's below) a week or so back but are bigger for more cooling. Cooling was adequate for now, but summer is coming and it will be 50-60 degrees hotter outside so we are getting the 5 ready now. We also made a new and bigger carb air exhaust cover. It covers about twice as much of the exhaust pipe and will give us hotter air and also function as a heat shield for the radiant exhaust pipe heat on the oil cooler lines. 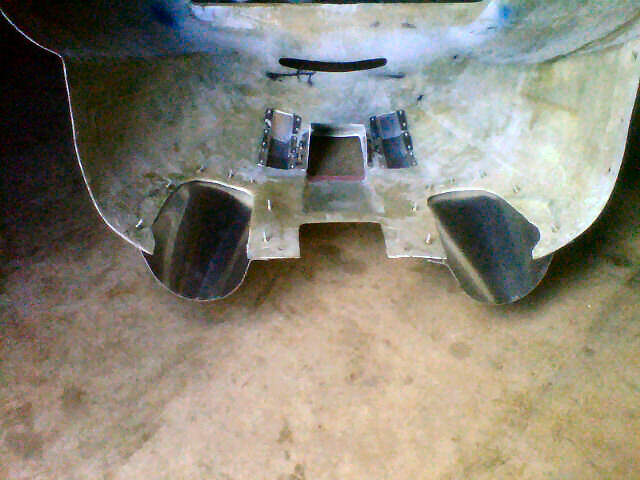 We took out and covered up the holes where the six angled cowl vents were in the center of the cowl. We also changed the oil and filter today. Thanks to Pat Panzera, we also now have a manifold pressure gauge - so data for prop selection should be easier and more accurate... Ordering a new prop is next on the agenda. Dave also made a backup canopy latch which functions to keep the canopy closed just in case someone forgets to latch it properly... The suction on the canopy is HUGE even during taxi. I found this out on my first taxi test long ago when I was holding the canopy slightly open for cool air and gave the engine a little power to get it moving forward and WOW....that canopy came open fast. I caught it in time about half way open but....took lots of strength even at very low throttle setting. We need to emphasize that a huge amount of testing and trying various things goes into developing a prototype like the 5... one that is really NICE to operate. We could have saved tons of time and not redone hardly anything and the 5 would have been GOOD - but GOOD is not what we wanted... We want it to be better than good. Comfortable, usable, safe, easy to build...a dream to fly. We want it to feel RIGHT. SO.>>>>> I am not saying this for any reason except to let you guys know that a LOT of thought and testing has gone into Dave's airplanes ...much more than you would think. This has been the case all through its entire development. For example, we changed the seats and rollover structure angle several times. The landing gear was moved forward 5 inches or so....which meant the drag brake had to be completely relocated with new linkages. The bottom line is>>> Think long and hard before you build it different from the plans....it probably won't be better. Of course you can always call Dave or I and see what we have to say about something. BUT, after all it is YOUR plane and you can do what you want. I just wanted to let you know, after thinking of all the different brake options we tried, that if you follow the plans you will save yourself a ton of problems. Tomorrow it is supposed to be very windy. Too windy. So I will do honey does tomorrow and fly Sunday. I should have an update Sunday night. Keep building guys....it is WELL worth it. You are in a VERY select group of people. Enjoy it. An early result of the 40 hour flight test period was the need to reduce CHT and OIL temps. 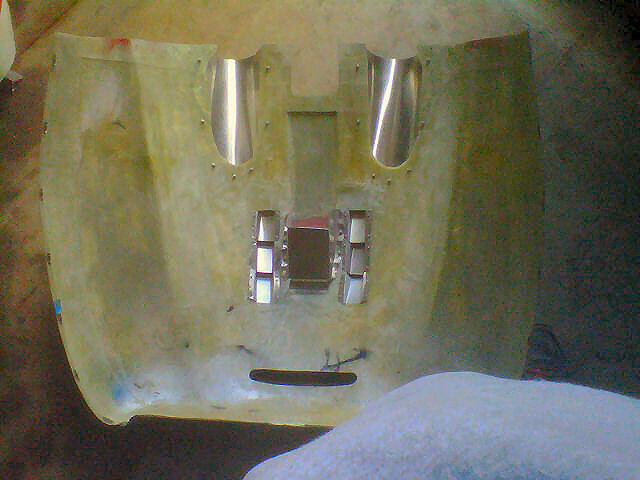 These are the CX5 cowl modifications made by Dave and Glen that reduced oil temperature by about 30°F. The slot at front of the cowl for the oil cooler was enlarged and outlet fairings were added around both exhaust openings. "Again, I was half way to Alabama as the day began to get light. I was there by daylight and ready to go. The weather guys had said it would be a nice day but they underestimated it. It was GORGEOUS - we get only a handful of days this nice per year. Silky smooth cool air (engines and wings like cool air) and visibility to die for. Awesome!! I took off and at 3000 feet could see Pensacola and beyond to Ft. Walton (70 miles) in one direction and half way to New Orleans in the other. I could see the gentle curve of the Gulf as it nears New Orleans. The Gulf had not a single ripple. Wow. And it was so smooth I kept hitting my own wake when I flew big circles. I tried holding the Sony Cam in my hands for some short videos and it worked well. It does distort the wings - they ARE straight on the leading edge, I promise. And they look a bit more slender in the video than in real life. Dave and I know the prop is way too fine and are going to order a new one soon. Full power at level flight puts me past the engine redline before I can even get all the power in, long before the plane has time to even accelerate so.....it is WAY too fine. At cruise power (21 inches) I get 110 mph but am turning too many RPM so we expect a LOT faster cruise speeds with the new prop. We are consulting with a propulsion engineer recommended by Joe at Revmaster to see what he says about the prop and , of course, we have a pretty good idea from what performance we are getting with this prop. It is a Tennessee prop 54/46. The new prop will have much bigger numbers." "Power is at low cruise at about 3000 feet. This is a very low cruise that, if my figures are right, means I was running about 18 inches of manifold pressure. That is LOW power for sure." "You will notice I am at cruise power, actually a somewhat low cruise setting, and climbing at about 500 fpm up to about 3000 feet. Airspeed varies from about 90-95. I see no need to push the engine at all (fuel too) to get the 40 hours and since I am not going anywhere, I just kind of "slow cruise" around. Why not. I am using about 3 gph at this low setting." Experimental aircraft test pilot Glen Bradley is prohibited from taking passengers along for a ride during the test flights of the two-seater Thatcher CX5. But he’s giving them a taste of what it was like to have the wind beneath the wings of the two-seater experimental plane in a video posted on YouTube on New Year’s Day. Ride along on test flight: Glen Bradley takes viewers on a test flight of the two-seater Thatcher CX5. 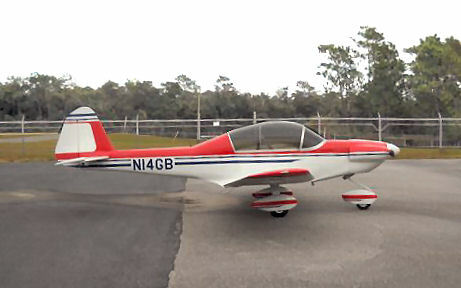 The video is of the first test flight of the aircraft on Dec. 23 at Jack Edwards Airport in Gulf Shores, Ala., one of the few airports in the area at which an experimental plane can be tested. Bradley took it on an abbreviated flight on Dec. 17, but had to quickly return to the runway when a gauge displayed a faulty reading. 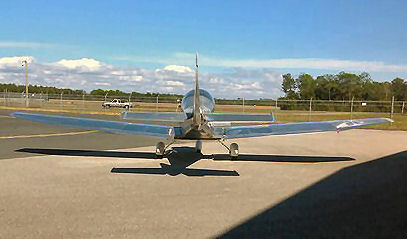 But as soon as weather permitted, he launched from the tarmac for a flight free of anxiety from a pilot’s perspective. 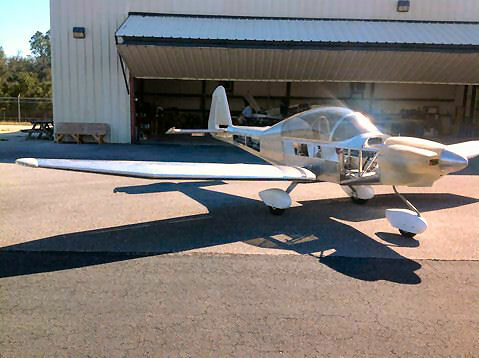 Named after its well-known designer and builder, Dave Thatcher of Pensacola, the CX5 is the brother of Thatcher’s first experimental plane, the CX4, a one-seater he designed on a McDonald’s napkin in 2003. He designed the 5 model amid public demand for a two-seater and spent the past two years building it with Bradley. 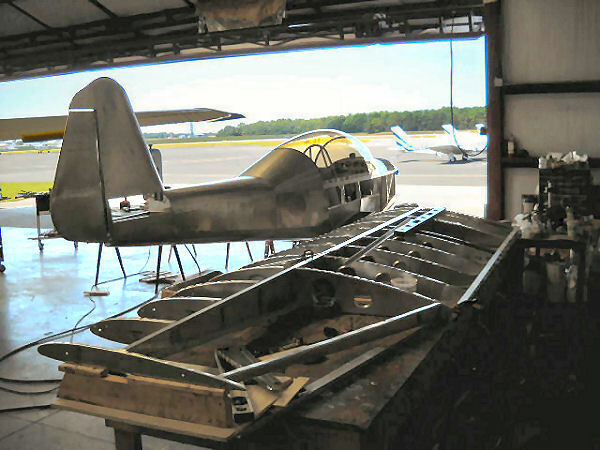 A story about Thatcher and his new plane design was featured in the Nov. 6 Pensacola News Journal. Both of his planes are like sports cars with wings that are propelled by modified Volkswagen engines but designed to be stylish, safe and affordable for amateur pilots. Although, he was at Jack Edwards Airport on Thursday ironing one small issue. 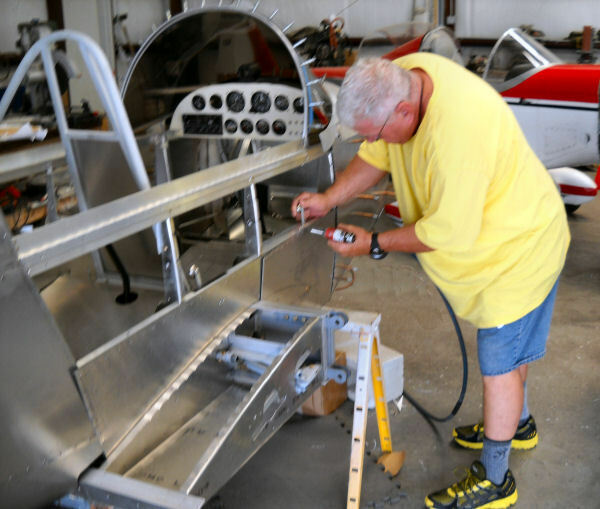 “The oil temperature got up pretty high, and I’m making a minor modification to a lower area of cowling to let more air out (of the engine),” he said. Such minor adjustments are to be expected, he said. 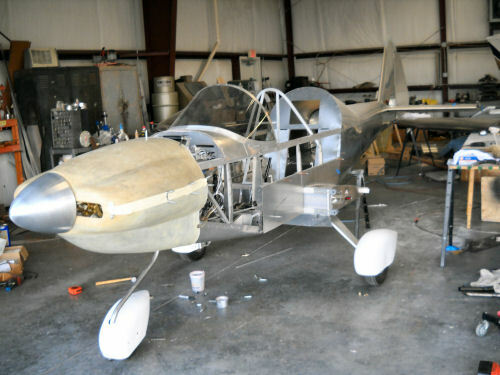 Since first taking the controls, Bradley has been logging reports for the experimental aircraft community, which the EAA industry online magazine says has been eagerly awaiting news on the details of the flight. “We were hoping it would (gain) 1,000 feet a minute, and it did,” Bradley said of the rate of speed with which the plane gained altitude. Bradley intends to take the plane through vigorous testing over the next few weeks, clocking about three hours of flight time a day. He’ll coax it into routine stalls and recoveries and takeoffs under different weather conditions, noting the details for a pilot’s handbook he’s compiling on the plane. Meanwhile, Thatcher is polishing off the plane’s plans for a growing number of pilots who are waiting to purchase a set for $475. He sold 574 plans for the CX4. The 5’s plans will be available after Bradley completes testing the plane, which he expects to be sometime in mid-February, weather permitting. 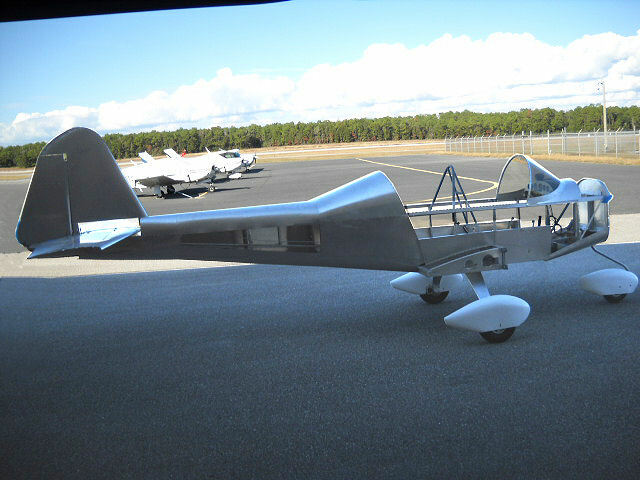 Two experimental aircrafts, the CX5, foreground, and CX4, were designed and built by Pensacola resident and airplane mechanic David Thatcher. More than 500 copies of his first aircraft design the CX4 have been sold to builders all over the world. Both planes utilize a Volkswagen engine and can be run on premium automotive fuel. "It is 3 PM...just got home. I was half way to Alabama when the sun came up this morning. Got the 5 out and ran it to determine which way the idle mixture was off. It wasn't running smooth enough at idle. Using what Dave taught me it was simple to find it was running lean. So...off came the cowl and a gentle Little turn of the idle mixture screw, less than a 1/16th turn. Cranked her back up... better but not enough. Another couple of small adjustments, less than 1/16 turn and she ran much better. Cowl on, wash hands, hit the bathroom, check the weather and FLY. A bit gusty but not too bad and pretty much down the runway. Ceiling maybe 2000 . Nobody flying yet... hasn't been all morning...g ood time to go. Strapped in, checked everything and ready to taxi out. Doesn't take but about 4 minutes... and found I was number three in line to take off. ha Amazing. I flew for over an hour and a half....around the airport. I checked all kinds of stuff but mostly just relaxed and watched the view... and the instruments... and the other airplanes landing and departing. Cyl Hd, oil temp, and EGT all settled down after about 5 min. I then flew at reduced power settings for a while to see what airspeed I would get....and lost amazingly little airspeed. All the time watching the students below taking off and learning to fly. I keep my eyes OPEN around airports. Beach, condos, water, ships, birds on the airport, cars, inter-coastal waterway, golf course, a few steep turns, dodge the cloud layers coming in off the Gulf. Notice the updrafts and bumps when under the layers coming in... reminded me of my glider flying days. Announce descending and entering downwind. Came in high on purpose, this thing floats and floats but...lands at 45 if you wait long enough. Taxi in, Check plane over, fill w fuel, take a break and eat some airport food - not very healthy but right on the field and only a short walk down the ramp...and free. Nice people here at Jack Edwards. Talk to the instructors that are thinking about letting some new solos go up. Weather improved a lot. Still at 2k though, but some blue sky every now and then now. Take back off, same things, a little tired now after almost two hours aloft. Beach, condos, water... uhhhhhh CESSNA 150 descending out of the sun... VERY close and closing on a 45-60 degree collision course... this requires IMMEDIATE action. I pull right into a tight climbing turn thankful for the 5s control responsiveness. They whiz past under me somewhere... I turned WAY too sharp for it to be a problem but thank God I saw them coming when I did. About 5 more seconds and we would have been VERY close, maybe would have missed by 50 feet but... I come around and see then on their same course... no changes. I call them on Unicom and ask if they saw me...they SAID "yes, you were averting." No kidding!!!!!!! I would not want MY pants on fire in a C150....ha. THAT is why I keep my eyes open and scan. They were 800 feet above pattern entry altitude and cutting across midfield descending to a downwind on the other side of the field. They may have seen me AFTER I averted a few seconds away. I'm sure the big white bottom on the 5 looked huge to them as they looked up, astonished. This was a flight WITH an instructor I think. Reminded me of the time decades ago when I was AT pattern altitude on downwind in my Tcraft when a strange vibration/humming sound began. All instruments looked normal and no engine vibration then the sun went away. I look up about 20 feet to see the oil streaked belly of a Mooney descending on top of me. He slid past rapidly. Fortunately he was as fast as he was or neither of us would have known what happened. AGAIN>..he was breaking the rules...just like the C150. Most of the rules have good reasons behind them. Anyway, I am tired. Supposed to get VERY cold here...in the low 20s and very windy...25 plus knots the next few days so that is why I tried so hard to get some hours on the 5 today. It's a tough job but somebody's gotta do it......"
Glen Bradley had added a Sony Action Cam in the CX5 for Mondays flight, and following a great edit of the video by his son, just posted it on YouTube. This is his first in-flight video in the CX5, and we're certain he will be posting more as he works to fly-off the initial forty hours. "This flight was about 30 min but mostly flying around the airport, so my wonderful son edited it down to 7 min. I am flying over Gulf Shores AL, a nice community about an hours drive from Pensacola. Phase I test flights are not allowed in Class C airspace so I will fly the 40 hours off there. The canopy was covered with fog for the first bit of the video but it cleared. As soon as I take off I fly off on an angle to the runway so as to make it easy to lose altitude on the remaining runway (two turns are required and each one loses altitude). Then as I near 800 feet or so I am in a great position to make a 180 back in the opposite direction to land without the extra turn to line up with the runway. I try to stack the cards in my favor on test flights. I level off at 1000 feet and get up to cruise speed but was also climbing a little so I just let the altitude creep up to almost 2000. The airspeed indicator is one that straight down indicates about 122 mph so I was not far from that at cruise with the Climb prop. I lifted off in about 750 feet (displaced threshold is 500) and came in high and hot on purpose even though the plane felt totally solid- it felt a lot like the CX4 but a little heavier on the ailerons. I slipped most of the way down final (notice nose is offset to the right) and still had way too much speed so I floated a long way past the video crew. My actual touchdown point is hard to discern from the video because it was so smooth (smiling) but it was WAY down the runway and well below 50 mph. The 5 is very stable on the ground and in the air. I had to taxi in on a service road instead of a taxiway so it was very narrow. Notice that even with almost no time in the plane it taxied so well I navigated the narrow road easily and with a good speed. I was smiling and quite happy all the way home...and beyond. Now that my son has learned how to edit the video footage I will be uploading others of things like steep turns, stalls, etc. I hope you enjoy the video." Glen, The video of the flight turned out great. With it, you're sharing the excitement of these initial flights with potential builders all over the world. On behalf of everyone that will be watching, Thanks for your efforts! Kudos to your son for his edit. He did a beautiful job! 2013/12/17 The CX5 was flown for the first time today! "The day dawned bright and cool, but the cool in the 40s was destined to move to the mid 60s by mid day. Dave and I met at Chick-fil-A as usual and headed out for the 1 hour plus drive to Jack Edwards Airport to begin the process of putting the CX5 together. We were hoping we had all the various screws, nuts, wrenches and what ever that we needed to assemble the plane. I was hoping we would at least get it assemble in time to run some high speed taxi tests before flying but wasn't at all sure how long it would all take. We put the wings on first....didn't take long. The big bolts are easy ....Then hooked up the gas lines, fuel tank drains, ailerons, put the aileron balance weights back on and, of course, the wing gap strips. Then to the tail feathers>> same deal. Four bolts for the stab, elevator pins through the hinges, etc etc. 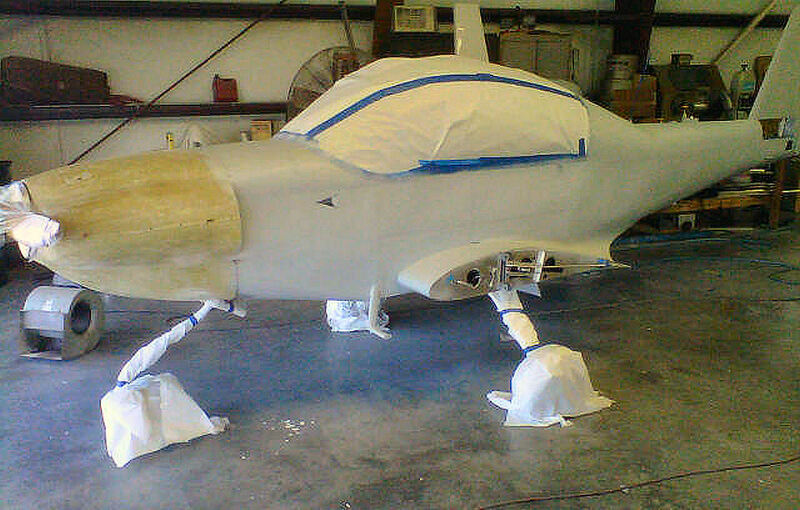 Then the wheel pants and various panels and trim. We got most of it done by noon and headed to lunch after having 4 gallons per tank put in so we could see if any leaks appeared during lunch. We ate gourmet>>> McDonalds- FAST food. Dave mentioned how we would have plenty of time to fly it some today. Wow, I was 100% ready to hear it put quite so casually but knew he was right. Heading back to the airport the wind picked up a little...about 8 knots and a few gusts out of the West, but not too bad. Beautiful blue sky. No leaks so 5 more gallons per tank- no need to top them off. A few more panels and it was done. Checked the tanks for water etc and it was time to FLY. I had told Dave I planned on doing an land-back or two and then take off if all was well. I planned on flying off runway heading about 30 degrees once climb was established so as to make a turn back to the runway easier if one was needed- after I had sufficient altitude. If a problem occurred while I still had sufficient runway ahead (but now off center) the two turns required to get back on runway centerline would help me lose altitude. I try to stack the cards in my favor in situations like that. So....crank her up, checked controls free, tuned Unicom, set 1200 in the transponder, taxi and announce that I would be in an Experimental airplane, first flight, and would be taking off down the runway 27 and landing back, NOT departing. It was a long 7000 feet to the end....a few little gusts but no problem. Did the mag checks (4) on the roll and checked all gauges green. As I neared the end of the taxiway the traffic taking off turned crosswind so I WAS GO. I didn't even slow down at the end but announced again and rolled some throttle in as I turned onto the runway. Smooth, slow power up to full power-- no significant extra rudder needed (or if it was I am used to it from the CX4). At 45 I take the weight off the nose wheel, acceleration was FAST....soon I was at 55 and levitating rapidly. The plane lifted off in a flatter attitude than the CX4 does and climbs like mad. I soon was 30 feet in the air and accelerating so I eased back on the throttle and eased down to about 2 feet and let the speed bleed off. Chirp, chirp, at about 45 or 50. I wasn't looking at the gauges until after touchdown. Let the nose ease itself down at about 40 or so and taxied off the runway. I was soon at the end again and traffic was clear so I announced...."First flight, Experimental aircraft 14GB, departing runway 27 Jack Edwards, will stay in the pattern." Second time same as the first--- ease nose up a smidge at 50 or so and hold it. Soon I was at 65 and off and running. Got my planned 80 (for first flight only) almost immediately and noticed I had to push a smidge forward to maintain so I pushed trim about half way forward and all was trimmed for 80. Turned my 30 degrees L an by now I was at 500 feet and climbing at well over 800 fpm....even at 80. Climbed to 800 feet before I knew it , my decision point for going on around the field, and flew back toward centerline about the time the end of the runway passed beneath me 1000 feet below. 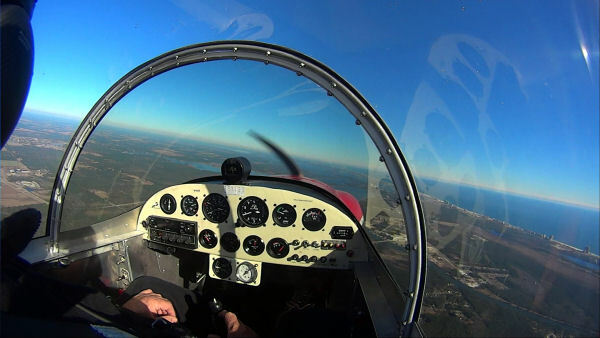 A nice 25 degree bank to begin a 180 to downwind and level off at about 110mph. I was going to let the speed build and fly around the field but noticed I didn't have any fuel pressure even with both pumps running (one mechanical, one electric) so I figured it must be the sending unit or gauge but decided not to bank on that during a first flight. Oil temp 180. All other gauges green. The engine ran GREAT!! The plane flew great. So I called in that I was on downwind for landing. I kept it a little high on base as I retarded the throttle to idle. As I turned final I was a bit high so I tried a quick slip and it felt just like I was in the CX4. I kept 80 over the numbers, 70 down to 20 feet and then gradually slowed her down as I got to about 2 feet. I then just kept coming back and back to see when she would settle in. About 45-50 she settled and I let her. Stick was not full back but was close enough For the first flight. After all- a LOT was going on. New plane, new airport, new radios, new everything. The landing was quite smooth. I was surprised and very pleased with the landing. Let her slow down and turned off mid-field. One can tell right away the two planes are brothers. Not only do they look alike, they fly very similarly. I felt very much at home in the 5 but some things are strikingly different. The flying behavior is VERY similar. I automatically flew the 5 just as I would the 4 and noticed no significant differences except the 5 seems to climb at a flatter attitude. This may be an illusion because the visibility in the 5 is even better than the 4 and it is already awesome in the 4. The canopy in the 5 is more rounded and higher....that, combined with the fact that the wing is about a foot or so further back in the 5 gives one a view of much more ground below. One sits more OUT in front of the wing. This, combined with higher seating position in the 5 makes one feel like they are flying a fighter. It is REALLY superb. I did take time to glance down the beach today for a few milliseconds on downwind and it was a gorgeous day....could see clearly for many miles. I almost stayed aloft and enjoyed the view but thought the prudent thing to do on a first flight was land. As soon as we get the fuel indicator issue sorted out you can bet I'll be right back up there.....flying off the 40 hours and writing up pilot reports. Also, the CX5 is a beautiful plane. EVERYONE comments on how great it looks in the air and on the ground. Dave said it sure looked nice flying over with the strobes going today. I'm sure it did...and it looked great from inside the airplane too. All of us know that Dave hit a home-run with the CX4 and I told him today he has now hit TWO clean out of the park. Congratulations, DAVE on another elegant airplane. Smiles all around. Dave, Builders all over the world congratulate your efforts with the CX5. Everyone has been patiently waiting for the news of her first flight today. Glens initial PIREP indicates that you've realized yet another dream. We all share in the excitement, and look forward to your future comments as the 40 hours are flown off. Glen, Your efforts with Dave and N14GB have been appreciated by many. You've assisted Dave in bringing another dream to reality in remarkable time. 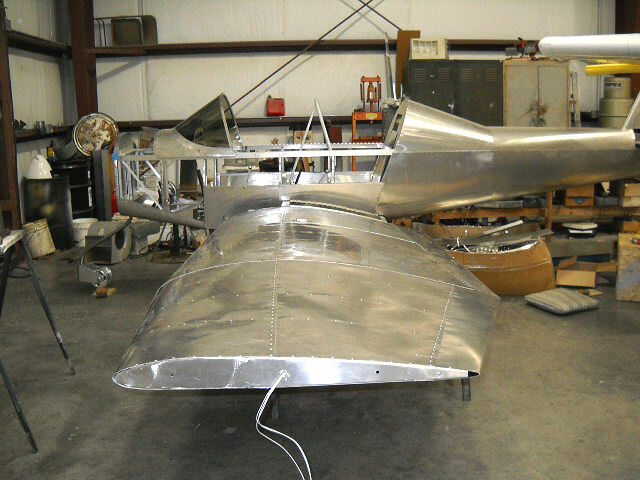 The detail of your reports on the fabrication process and now flight of this bird have been incredible. Thanks for everything you've done! Now I have to ask... Did anyone get a photo (or two) of the flight? Dave Thatcher reminds you of silver screen icon Jimmy Stewart with his subtle wit, lanky frame and down-to-Earth demeanor. But Thatcher has spent his lifetime tinkering with ways to stay un-tethered from the terra firma, even if it’s only 10,000 feet above it. 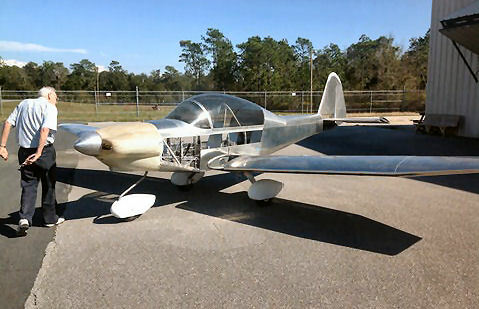 At age 81, the Pensacola aircraft mechanic, designer and builder has just completed fabricating his second experimental airplane. Think of a two-seater sports car with wings, propelled by a modified Volkswagen engine and designed to be stylish, safe and affordable for amateur pilots. 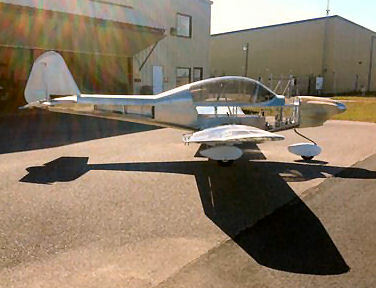 Online experimental aircraft forums are buzzing about the Thatcher CX5. 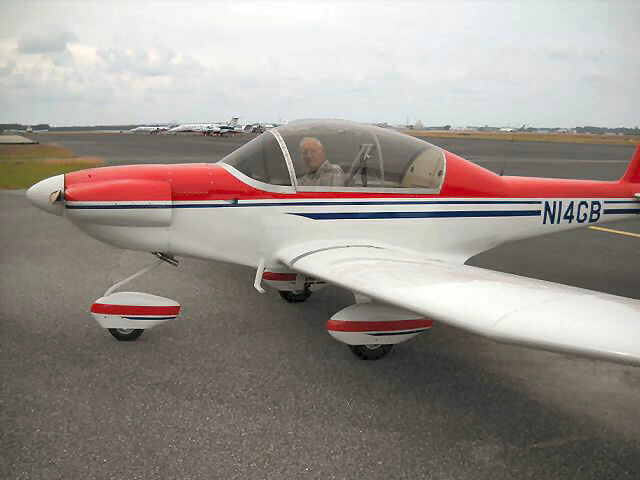 Already some 50 aviation buffs have lined up to pay $475 for the plans to build the plane for roughly $25,000.That’s a bargain considering the engines of many kit airplanes cost more than $100,000 alone. 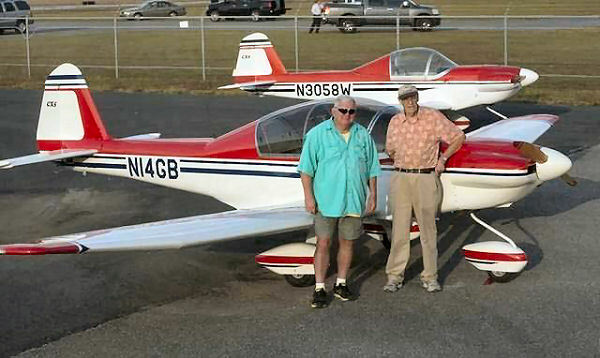 He sold 547 plans for his first plane, the one seater CX4 he completed in 2004, to amateur plane builders all over the world. The CX5, which seats two, is a larger version of the CX4. Thatcher created the concept for his planes, much in the same way musicians jot down lyrics when inspiration strikes — on a paper napkin. Thatcher inked his design while eating in the Bayou Boulevard McDonald’s restaurant one day in 2003. Glen Bradley, who spent two years alongside Thatcher building the plane, recently pointed out the features that make the CX4 and CX5 special — curves where other aircraft have straight lines, customized hand-hammered canopy trim, sloped canopy and air pants (covers on the wheels). “I’ve always wanted to build my own plane, but it wasn’t until after I retired that I had the time and money to do that,” Thatcher said. He retired as the service manager at Pensacola Aviation Center in 1997. In a hangar on the private side of Pensacola International Airport on Monday, and over the roar of a steady stream of commercial airliners taking off nearby, Thatcher and Bradley, put the finishing touches on the CX5 in preparation for an inspection later this week to deem it air-worthy, the final step before the first test flight. 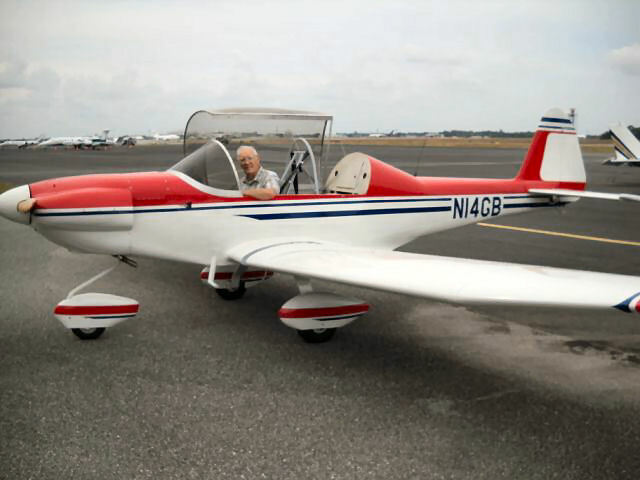 Bradley, 65, a retired college professor, has logged 6,000 flight hours since earning his pilot’s license at age 16, and will conduct the test flights. 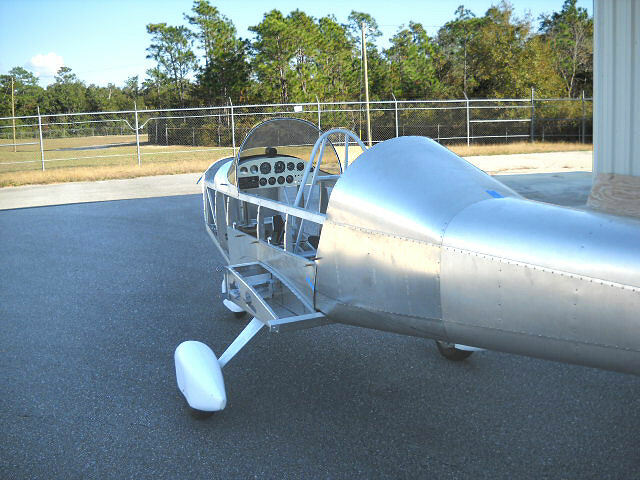 Experimental planes are not allowed to fly at Pensacola International Airport, so the wings will be taken off and the plane will be taken by trailer to Gulf Shores Jack Edwards National Airport, which allows experimental aircraft to be tested. After they’ve flown 40 hours, expect to see the CX5 flying over the skies of Pensacola often, Thatcher said. Bradley is confident in the plane’s flying abilities and expects few problems with the new prototype. The plane will cruise up to 125 mph and travel about more than 300 miles on one tank of fuel. Adding to the cost-effectiveness, the plane can be designed to operate on non-ethanol automobile fuel that’s about $3 less a gallon than aircraft fuel. It also lands at 40 mph, a speed that increases the survivability of crashes, Bradley noted. 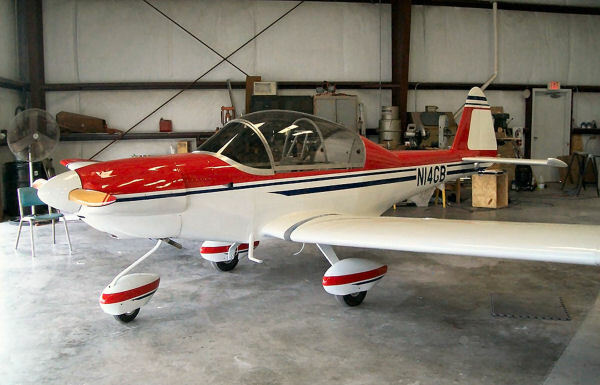 There’s a host of retired and current military, and commercial and amateur pilots who desire small airplanes for weekend getaways or just soaring into the blue skies, Thatcher said. 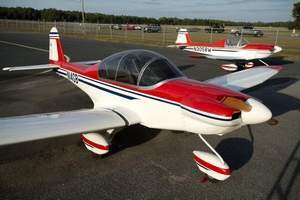 John McKienan, president of the Pensacola chapter of the Experimental Aircraft Association, said about eight members of the chapter are working together to build one of Thatcher’s CX4s. He’s sure there will be demand for the two-seater. “What’s nice about his plans, you really don’t need sophisticated tools to build it from scratch,” he said. 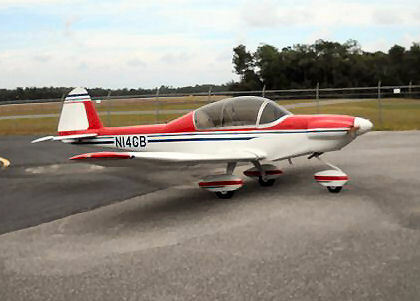 Some kits require purchasing $2,500 worth of tools just to build the plane. “If you go to Dave’s hangar, he has tin snips and band saws and drill presses and wooden forms to bend metal. And that’s the appeal,” McKienan said. Thatcher is a bit of a legend in the world of experimental aircraft, Bradley said. Thatcher spent a lifetime collecting the skills he needed to follow his childhood dreams into the world of aviation. Upon graduating from high school in Signal Mountain, Tenn., he was drafted into the Air Force during the Korean War. He had aspirations of ­becoming a pilot but started out as an aircraft ­mechanic. “You could be an enlisted man for two years and that would qualify you to go to the cadets if you passed the tests,” he said. “I passed all of them, except the physical requirements. I didn’t weigh enough for my height. By that time, I had fallen in love with being a mechanic. I’ve been working with airplanes ever since.” He honed his skills at Embry-Riddle School of Aeronautics for Aircraft Mechanics, then located in Miami, and he built on that knowledge through a correspondence course on aeronautical engineering while in the Air Force. Around age 20, he earned his private pilot’s license and purchased his first airplane, a Piper Cub, for $400. While Bradley clocks 40 hours on the CX5, Thatcher will make final adjustments to it and its plans before offering them up for sale. And then he said he’ll move on to his next project, which he’s still pondering. 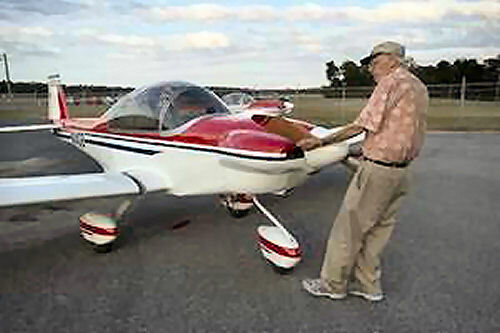 David Thatcher pulls his experimental aircraft, the CX5, back into the hangar. Thatcher has been working on airplanes all his life and is close to completing his second aircraft design. More than 500 copies of his first aircraft design the CX4, seen in background, have been sold to builders all over the world. Both planes utilize a Volkswagen engine and can be run on premium automotive fuel. • Weight: Gross is 1,300 pounds. Empty is 721 pounds. • Cruise speed: 125 mph (201 km/h). • Fuel: Holds 10.5 gallons automobile fuel. • Engine type: 85-horsepower Volkswagen air-cooled engine. 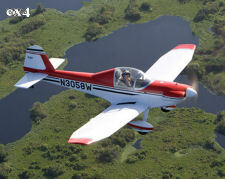 For more details on Dave Thatcher and his planes, visit www.thatchercx4.com. 2013/10/30 The CX5 Paint Is Complete! We're not the only one that has been waiting for these! Dave just sent us a couple of new photo's, and asked that we get them posted right away for everyone to see. Yes, she's another beautiful bird Dave! 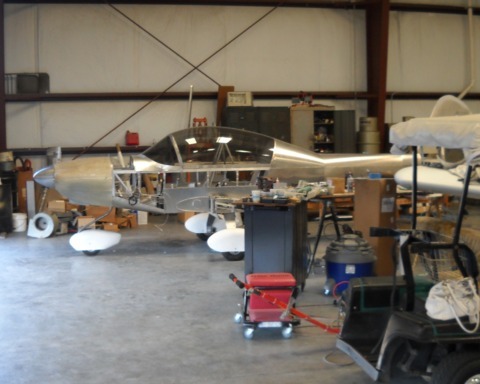 He mentioned having a DAR inspection, then she'll have to be disassembled once again, and moved to a field where flight testing can begin and any required changes made. She's getting closer, and he'll keep us posted with the progress. 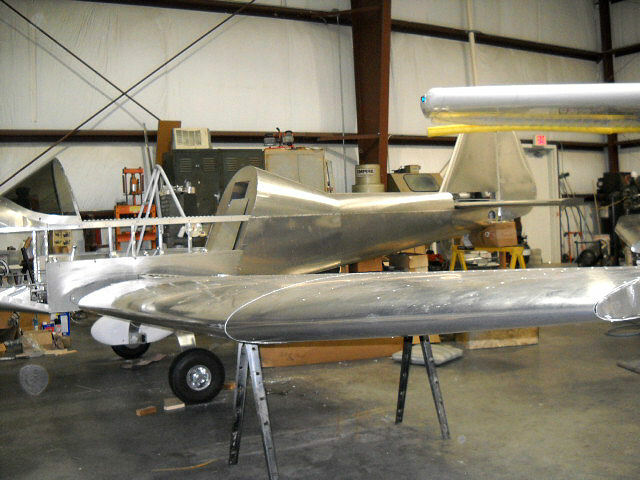 2013/9/18 Dave and Glen report that the wings are painted and the fuselage is in primer. N14GB has been assigned, and she sure is looking nice! 2013/8/22 The prep work is done, and Dave is personally applying the first coat of primer to the CX5! "The CX5 is completely done except for painting and final re-assembly. It has been completely assembled, but was disassembled for painting because Dave decided to paint it before flight testing. It WILL be a pretty sight for sure and will be painted in the same general scheme as Dave's CX4. I spent this week scuffing up the wings and filling in rivet holes and will do the same on the fuselage and tail feathers next week. Dave has had lots of parts to make for CX4s so he has been doing that. It is also VERY hot and humid in Florida this time of year so we are working shorter days. Some of you asked how long it will take Dave to draw up the plans. Well, Dave corrects and redraws them as we go along so as soon as the airplane's initial flight testing is done the plans will already be ready to print. It is a VERY pretty bird." Glen sent us his CX5 presentation on CD via the US mail service because the PowerPoint presentation was too large of a file to attach to an email. It was received yesterday, and we've been working since to get it on-line. The presentation consists of 47 individual slides, with notes added by Glen below many of the slides. The Google Translation tool (at the top of every CX4 Community webpage) can be used to translate Glen's presentation to many different languages. We've also added a PDF file of the presentation (with a smaller file size and a link on the page above) that can be viewed or saved to your local computer. We appreciate everyone's patience with getting this online, and ask that you contact Glen if you have any additional questions on the presentation. Sun n' Fun on Friday, April 12th. Everyone in attendance got a behind-the-scene perspective of Glen, Dave and the work being done on the CX5 prototype. 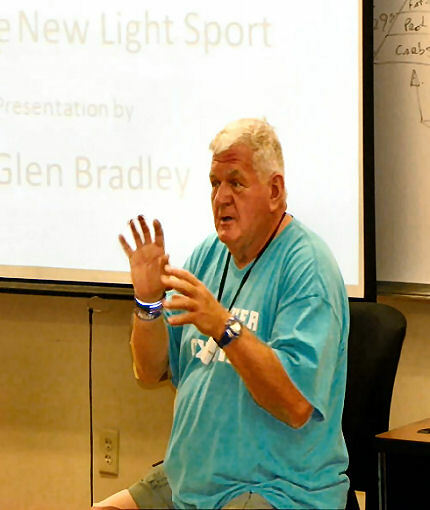 There have been many posts on the Yahoo group site since Saturday regarding Glen's presentation, with everyone wondering if it could be placed on-line. We've been in contact with both Dave and Glen, and are currently working together to get Glen's presentation on-line here for everyone to see. Our Community website has a huge international audience, and many visitors translate the content of the individual pages to their native language using the Google tool at the top of every page. We want to preserve this functionality with Glen's presentation, so it will require a little work on our end before it goes on-line. We appreciate your patience and will let everyone here and on the Yahoo group website know when the presentation becomes available. "We installed the wings on the CX5 and thought you might like to see what the girl looks like. Some of the side skins were left off to make installing the controls, electrical system and battery easy." 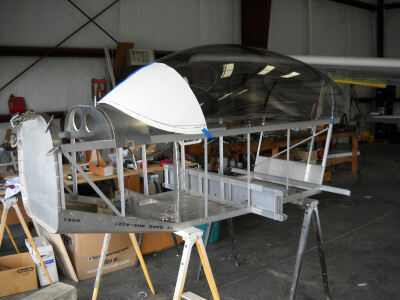 "It looks like not much has been done since the last photo, but the fuel tanks have been installed in the wings, the fiberglass wing and elevator tips, wiring and instruments and brake system are about finished. The flaperons system has been removed and speed brakes have been installed. 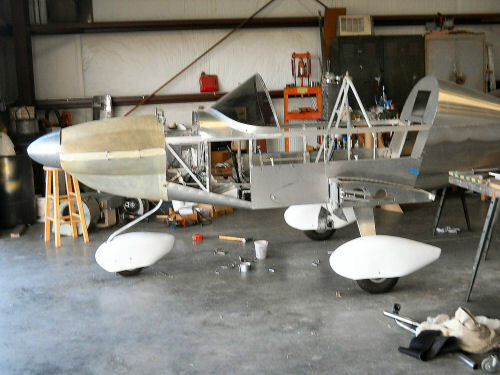 The engine controls and wiring have been installed." Dave posted two new photo's on the CX5 in the Yahoo "Advisories" photo album on Thursday, showing the preliminary engine and cowl installation. He also sent them to us for posting here. We apologize for the delay, but we're still running on a generator after a blizzard-induced power outage here in Wisconsin. Dave has been very busy with work on the prototype. It's been a couple of months since the last update, so he sent us several new photo's showing the latest developments. Dave sent us a couple of photo's showing the on-going development of the CX5 prototype. Although the manufacture and shipment of orders for CX4 components takes top priority every day, Dave continues to make solid progress on the prototype with the help of a good friend. As a reminder, Dave cannot comment on availability of plans for this beautiful aircraft. An enormous amount of work remains to be done, followed by eventual flight testing, design work required to eliminate any "bugs" discovered and the actual efforts required to make the changes to the prototype. He will continue to keep us informed. "Progress is moving now. 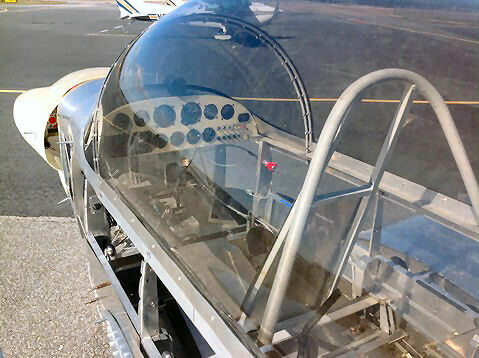 We have the fuselage and controls ready except it is not on the gear yet, The tail is finished, the instrument are in and the radios are going in now. I have the engine but it is not installed. We are starting on the wings now. Work on the ribs-to-spar installation was done today. With over 500 sets of plans out for the CX4, making parts for people keeps me real busy. This seems to be the big problem with getting time to work on the 5. I have a real nice gentlemen helping me now, and this has given me a real boost on the CX5. 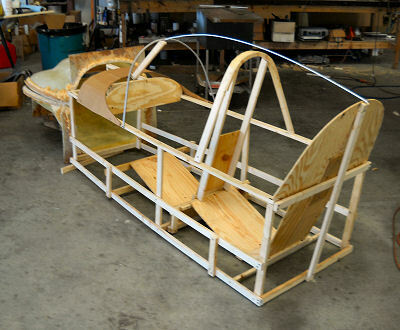 "The prototype I am making is a tri-gear with front seat solo. 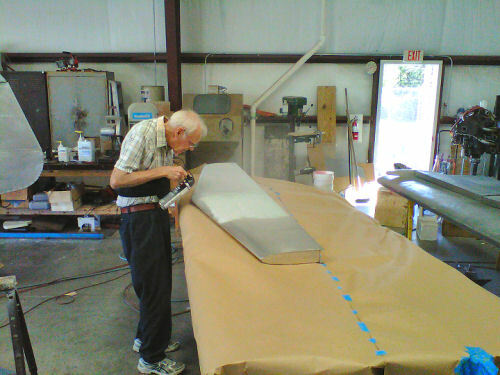 Peter Beck is working on the tail dragger. I have ordered the engine and have the canopy. 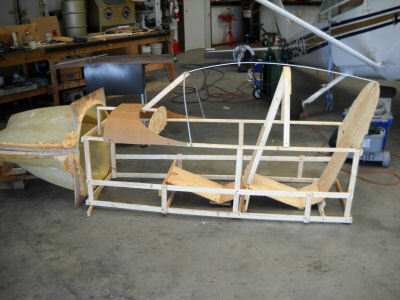 The forward section of the fuselage is going together nicely back to the rear seat. I have the wheels, tires and brakes. The instrument panel has been cut." 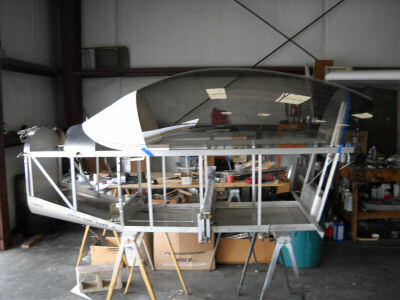 "As soon as I get the instrument panel installed I can begin to fit the canopy, windshield and latch system. The flaperon control system has been worked out. The flaps will be electric. The plans are drawn, but until I make everything and fly it, there will be no announcement as to availability." "I'll be 80 in January so do not get your hopes too high. I am having fun building it though." May Gods Blessings rest on you all. As mentioned above, David is continuing to work non-stop on the R&D of both the CX5 and Tri-gear designs. Dave has just released this photo of the Tri-gear modification installed on his bird and has reported that the flight testing portion of the project has begun. With the prototype now flying, Dave wants it mentioned that the Tri-gear modification, although getting closer, is not yet ready for release. Further information (specifications, plans release, parts availability, cost, etc.) cannot be made available until all testing and any required design modifications have been completed. Dave appreciates the strong interest in this project, and will provide us with additional details here as soon as they can be released. For the benefit of those currently building a CX4 (or those that are seriously considering a build from the expanding CX family), a new web page has been in the works for quite awhile, and it's finally time to make it public. If you look at the link line at the top of this page, you'll notice a new "Builder Forum" link has been added. You can access the new forum using that link or add a bookmark (http://forum.cx4community.com/) to your web access program and go directly to it. Anyone is free to view the site, but you must register and sign-in to post to it. Registration requests have to be approved individually, so please be patient until your request is processed. The website is divided into individual forums covering the CX4, Future CX5, Engines, Props, Aircraft Performance and several additional related topics. Many of the groups are further divided into subforums, where your subject specific posts will be made. The subforum structure will make searches within the site much more effective. The forum has been created with software that has the capability of many optional features, all requiring a learning curve on the administrative side. The majority of these options have not been activated quite yet. An announcement will be made as they become individually available. Please post any questions, comments or suggestions to "Forum Website Comments" at the bottom of the Forum list. Dave Thatcher has set the LSA world on fire with the announcement of his new CX5 two-place design project. He has received many emails wondering how soon plans will become available. In a brief summary from his latest post on the Yahoo site, Dave has reported that there is a great amount of work yet ahead for the CX5. Although most of the plans have been drawn and work on the front fuselage section has begun, proving out the plans is a long process and many changes are expected to crop up as the prototype construction continues. 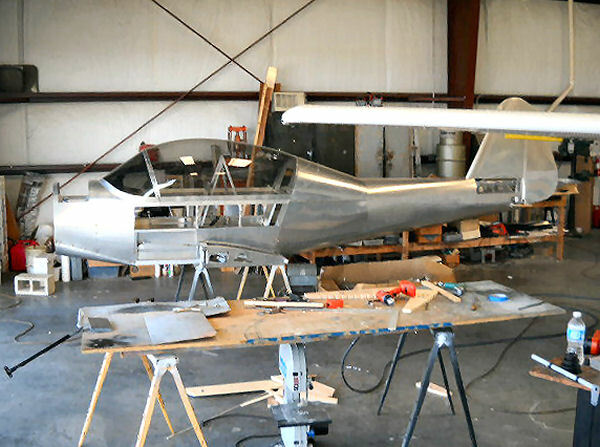 As Peter Beck outlined in his recent EAA Experimenter article, Dave will "release plans only after the prototype has been flown and completely flight-tested." At this point, it's not possible for Dave to provide a firm date when this will happen. Requests from many of you who are building, or thinking about building the CX4 have been heard. Although I like the looks of tail wheel aircraft, the last large volume tail wheel aircraft of any kind was about 50 years ago. 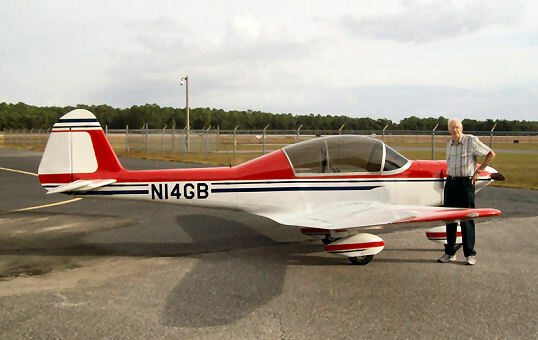 The cost of getting a tail wheel endorsement and the cost of insurance, and other factors have led me to offer the CX4 as a tri-gear or tail wheel. The CX5 will also be offered as a tri-gear as well as tail wheel. I appreciate and respect your advice and comments about this subject. I hear you. I'll get to work on this right now. Editor Note: CX4 & CX5 Tri-gear illustrations have been added to this site. Click on the "3-View Drawings" link at the top of this page. Additional information will be added here as it becomes available. David has placed a CX5 side view illustration and a 3-view drawing in the Yahoo photo gallery. Click here for a direct link. Editor Note: The CX5 side view is shown on the top right corner on every page of this website. The CX5 3-view drawing can be viewed here as well. Click on the "3-View Drawings" link at the top of this page. There is a two place CX4, called the CX5, in the mock up and drawing stage. Some construction is under way. It will look like the CX4, only with tandem seating. Availability is unknown at this time. Its a real beautiful looker on paper. It will have a Revmaster 80 or 90 HP VW engine.